Added by Indo American News on June 21, 2018. 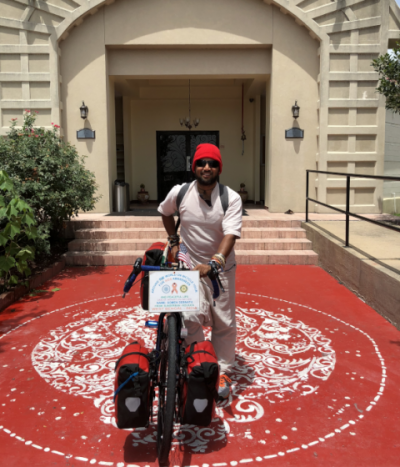 HOUSTON: Somen Debnath, the humanist, is on a World Bicycle Tour for HIV/AIDS awareness and to bring exposure to the rich heritage of Indian culture. He has just started his United States tour, entering Texas from Mexico. Starting in May, 2004 just after his graduation, he has visited more than 150 countries, more than 150,000 km and is on the way to more than 200 countries by 2020, when he returns to India. He arrived in Houston and visited the Hindu Temple of Woodlands, Char Dham Temple and also, biked with the bicycle enthusiasts of Woodlands. 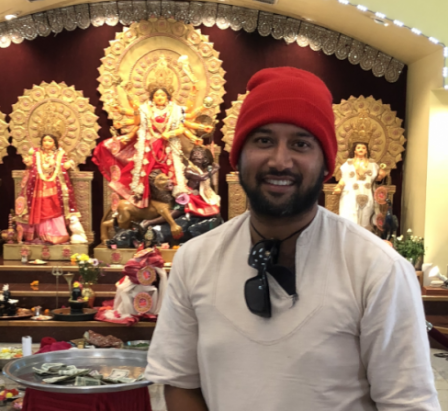 He visited Houston Durga Bari on Sunday, June 10. His visit was organized by Partha Sarathi Chatterjee, the ex-President of Durga Bari. After seeking blessings of Ma Durga, he had lunch with the attendees. He had an exciting presentation and Q&A session. Somen believes in humanity and Swami Vivekananda’s message and treats everyone as if part of a global village. Love and respect he shows others is always reciprocated. Somen got moved by the story of an AIDS patient being left to die in Kolkata in early 200 and got no answer from his teachers. He wanted to learn and spread awareness. He was captured by Taliban in 2009 and spent 24 days in captivity. They loved Indian food and impressed them by cooking Indian curry. They let him go. Humanity won! On his first trip to North Eastern India, he was accosted by robbers on a 5-km ride through dense forest. He gave everything away. He said since they took everything, he at least needed shelter for the night. He managed to convince the leader of the gang, who took him to his house. They were so happy with him that they let him go with all his items. Humanity won again! Somen asked everyone to follow their dreams and make the world a better place. He is collecting funds for his bicycle tour. After his tour, he plans to set up a museum of items from his tour and be on a speaking tour to bring attention to world’s problems and spread the message of humanity. Let’s spread the message of humanity and love!